In Telangana state we can find many historical temples. On those, The Manyamkonda Venkateshwara Temple is very popular in Mahabubnagar district. We can find very rare temples of Sri Venkateshwara god as ‘Swayambhumurthi‘, but we can see here as self manifested god. This temple is located in very dark forest with lush green trees. Everyone can feel a very blissful experience on visiting this historical place. The Lord Venkateshwara temple is located in the Manyamkonda or Manikonda hills. This amazing place is attracted by tourists as well as devotees and also you can enjoy these beautiful and mesmerizing locations. The people believed that the temple was constructed 500 years back. In the past days, here few ancient saints like – Ettepu Ramayogi, Yanumaddhasu, Narasimha Yogi, Veerappaiah and Kasirayalu have meditated. So the name is called this place as Manulakonda. The meaning of Manulakonda is “Manulu means Saints & Konda means Hills”. After the days passing the name has been changed as Manyamkonda or Manikonda. 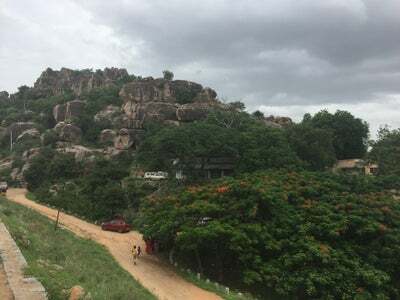 In Mahabubnagar district, many tourists are attracted by this place. It is 6 km distance from the Devarkadra railway station. The Manyamkonda hill is surrounded with lush green trees and looks very beautiful and scenic locations. The major attractive place in Mahaboobnagar is Manyakonda hills. From the Mahaboobnagar city, the Venkateshwara temple is located around the 13 kms of distance. The hill is 900m high and the distance to the temple and village is 2 km. The Venkateshwara temple is located in the top of the 3 hills and this place can also be called as Harihara Kshetra. For every year in the month of January to February time, the historical “Jathara” can be celebrated here. Prefer to see the temple in the time of Jathara. In time of Maha Purnima the festival can be celebrated. The Manikonda Venkateshwara Temple is also known as “Palamoor Tirupathi”. The distance between the temple to the Mahabubnagar city is almost 13 kms. On the highway of Raichur, the temple can be located. Many TSRTC buses are available to Manyamkonda Venkateshwara Temple. Tourists can also find many vehicles from the Mahabubnagar city to Manyakonda Temple. Next stoppage of the Mahabubnagar Junction named as Devakdra Railway station. You need to get down there and from here only km distance to the Temple. The Shamshabad’s Rajiv Gandhi International Airport is the Nearest airport to the Manyakonda Temple. Mostly you cannot find any hotels and restaurants in the temple, you need to take them from the Mahabubnagar city. In the top of the hill, tourists can find a Guest house; there you can book the rooms as well. You can also stay in Mahabubnagar for the better accommodation facilities.